Buying a new or used car in Los Angeles can be easy, especially with the large number of car dealerships in the area. Finding a reputable dealership on the Westside of Los Angeles that caters to all of your automotive needs and has the car that you want at the price that you want to pay is just as easy, if not easier. Come to Marina del Rey Toyota! Simply come on over to Marina del Rey Toyota for the best selection of new Toyota inventory. Our professional staff will be by your side every step of the car-buying process. We pride ourselves in quality customer service and won’t stop until you are completely satisfied before, during, and after you buy a car from our Marina del Rey Toyota dealership. That’s why we have been named the Best Auto Dealer for new and used cars, as well as the Best Auto Dealership Repair Service by The Argonaut Newspaper in their Best of the Westside 2015 competition. Each year, The Argonaut Newspaper sets up a reader’s choice poll where voters can choose their favorite LA businesses in 189 different categories. Marina del Rey Toyota is extremely proud to have been chosen for multiple categories in this year’s contest. We are your trusted Toyota dealership in Los Angeles, CA! Visit our dealership to see why our customers prefer our new and used car sales, vehicle service, financing, and more in the West Los Angeles area. Browse our entire new vehicle inventory and used vehicle inventory for your perfect vehicle match, and let our expert staff get you the best car loan or lease for your financial needs. To learn more about any of our vehicles, contact us at (888) 834-3068. 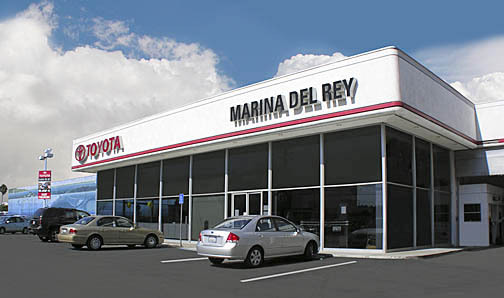 “Get a Whale of a DEAL” from Marina del Rey Toyota today!